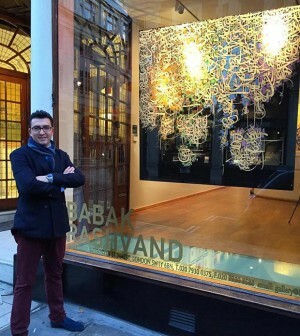 A visual artist and Creative Director, Babak Rashvand was born in Iran in 1980. He studied visual communication at the Tehran University-Faculty of Fine Arts, where he completed his Master of Arts in 2009. As a visual artist he finds his inspiration in painting, calligraphy, illustration and graphic art. 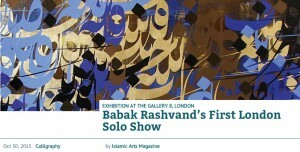 Rashvand is a recipient of many awards for his work such as the First award at the 22th National College Student Festival (The section of Typography) in Tehran-Iran, 2007; the Second award at the National College Student Festival (The section of Calligraphy Painting) in Tehran-Iran, 2006; the First award at “Falaq”, National College Student Festival (The section of Poster) in Tehran-Iran, 2006; the Third award at the 21th National College Student Festival (The section of Poster), in Tehran-Iran, 2006 and the First award at the 13th International Festival and Exhibition of Quran (The section of Calligraphy Painting) in Tehran-Iran, 2005; and many more. He has participated in many festivals and exhibitions in Iran, France, UAE, Russia, Austria, and Albania. The exhibition is on view until November 1, 2015 at the Gallery 8, at 8 Duke Street, St. James SW1Y 6BN.